Q: I have the Avatar 3D Blue-ray including MVC encoded, North American version, and my TV is the Panasonic VT65. It is played back via DLNA, served by Plex server. I want to watch in SBS with my 3D shutter-glasses in my TV, I have tried multiple programs convert the MVC to .AVI or .MOV or .MP4 or .TS or .264 (such as DVDFab and Pazera MKV to AVI) but they always make an SBS that is full of blocky dancing artifacts and is completely unwatchable and unusable. WHAT TO DO? Can someone tell me why the SBS turns out BLOCKY and UNUSABLE or suggest a tool that actually works? Thank you! Multi-view-coding (MVC) is an extension of the proven H.264/AVC industry standard that saves approximately 50% of the right view's datarate (compared to ordinary H.264 coding). This is achieved by exploiting the correlations between the left and right views during encoding. MVC has been adopted for 3D Blu-ray disks and is the recording format of the latest generation of 3D camcorders. Read more to understand MVC. And the reason why SBS turns out blocky and unusable is that, most importantly, SBS conversion lowers the quality. How to Rip 3D Blu-ray MVC to SBS without Loss onto Plex Media Sever? 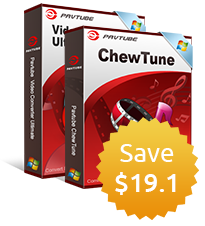 Pavtube BDMagic allows for 3D to 3D Blu-ray Side-by-Side, Top-Bottom, or Anaglyph 3D effect without quality loss for perfect streaming in different brands of TVs and playing in mobile devices, media players, or editing in software, etc. 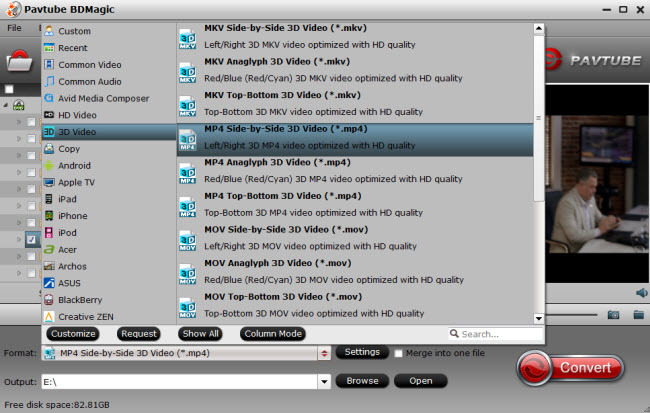 Also you can convert 2D Blu-ray/DVD from discs and folders to 3D videos in MKV/MP4/MOV/WMV/AVI formats. Following will show you how to rip 3D Blu-ray including MVC encoded to SBS onto Plex Media Sever for perfect streaming in Panasonic VT65 using Pavtutbe BDMagic. 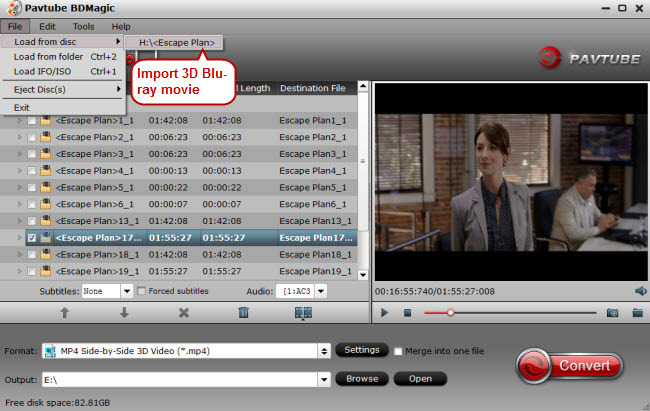 Launch the 3D Blu-ray converter on PC, and click "File" in top left corner and then follow "Load from disc" to import 3D Blu-ray movie from the disc. Mac users can try the Mac version 3D Blu-ray converter - the best DVDFab alternative of ripping and copying BD/DVD under Mac Yosemite. 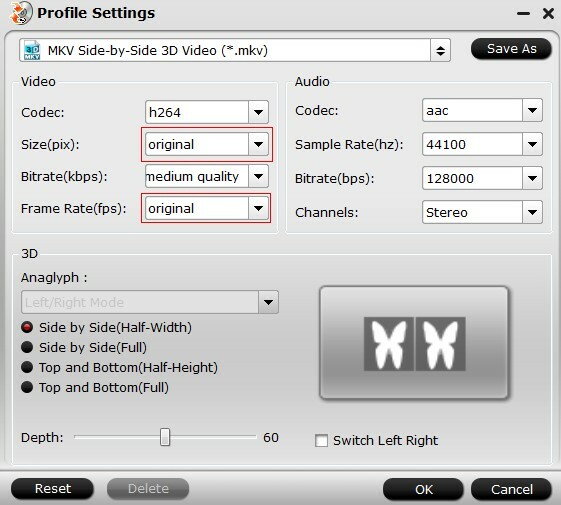 Check Panasonic VT65 supported video formats first and then go to the format list to select the correct 3D output format. Panasonic VT65 supports video formats like AVI, MKV, MP4, MOV, MTS, etc, just click on the format bar to follow "3D Video" under which you can pick the proper 3D format for Panasonic VT65 smart 3D TV. It is worth mentioning that VT65 can play FLAC audio file directly. Tips: If you want to keep the movie original size and picture quality without blocky dancing artifacts, you should not change the size and frame rate in "Settings". Just leave it as "original". Hit "Convert" in bottom right corner to start converting 3D Blu-ray disc to Plex Media Server. If you don't have Plex in your PC yet, please download from here. Read this article to learn how to use Plex in PC. Stream the 3D SBS 3D Blu-ray to Panasonic VT65 Smart TV by turning into Plex Media Server using DLNA (just make sure the same local network between Plex and TV at your home). Enjoy with your 3D shutter-glasses!